Quivira Golf Club—the epic Jack Nicklaus Signature Course at the tip of the Baja Peninsula marked by huge windswept dunes, sheer granite cliffs, and rolling desert foothills that debuted to acclaim last year—has joined with the award-winning Armonia Spa at the all-inclusive Pueblo Bonito Oceanfront Resorts and Spas to offer guests an unbeatable vacation combination. Quivira Golf Club—the epic Jack Nicklaus Signature Course at the tip of the Baja Peninsula marked by huge windswept dunes, sheer granite cliffs, and rolling desert foothills that debuted to acclaim last year—has joined with the award-winning Armonia Spa at the all-inclusive Pueblo Bonito Oceanfront Resorts and Spas to offer guests an unbeatable vacation combination. The mix-and-match program, designed expressly for couples, offers one round of golf and one spa treatment for each day of stay at Pueblo Bonito Pacifica or Sunset Beach Resorts. 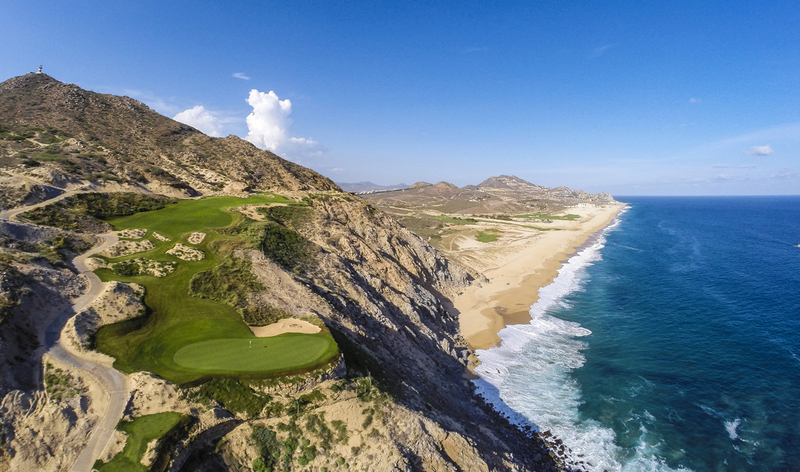 Perched above the spot where the Sea of Cortes meets the Pacific Ocean, Quivira, named the “Best New International Course” of 2014 by GOLF Magazine, is a dazzling $40 million layout that begins at sea level near the rolling surf before climbing to higher ground, where the scenery is a match for the challenge. In addition to thrilling risk-reward scenarios, Quivira features panoramic views of the cobalt-blue sea from every hole, with more oceanfront exposure than any other course in Los Cabos. A spacious, double-sided practice facility, located beside the handsome thatched-roof clubhouse, parallels the sandy beach and crashing surf. Off the course, guests can complete their experience with a choice of 50-minute treatments at award-winning Armonia Spas, sanctuaries that promise “a serene respite from the stresses of daily life.” Armonia Spas at Pueblo Bonito Resorts were specifically designed to meet the individual needs of guests. Unlike most vacation spas where guests receive little guidance in selecting the types and timing of treatments, the highly trained staff at Armonia specializes in designing ‘Individual Treatment Paths.’ These treatment paths allow guests to achieve their personal goals, be it pure relaxation and de-stressing, or specific fitness and beauty results. 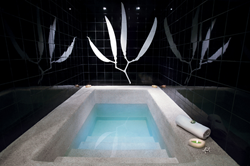 Deluxe treatments, designed for relaxation and renewal, include luxury facials, signature rituals (healing wraps that utilize natural aromatic ingredients), and massage therapies (including deep tissue and sports massages designed to relieve stress, stimulate circulation, and eliminate toxins). The “Golf & Spa Package,” starting at $415 per person per night (based on double occupancy) and effective now through March 31, 2016, features one spa treatment or one round of golf per day, with mix-and-match options available. The package is available to guests of Pueblo Bonito Pacifica Resort & Spa, Pueblo Bonito Sunset Beach Resort & Spa, and Montecristo Villas. All-inclusive services include deluxe accommodations, dining and bar service, beach and pool access, onsite fitness centers, daily onsite activities, and other extras. Shuttle service to and from the golf club is included within the Quivira development. For reservations or further information, access the web site at http://www.pueblobonito.com and http://www.quiviragolfclub.com or call 800-990-8250 to customize a visit. Quivira (pronounced key-vee-ra), Mexico’s premier luxury residential resort community, is situated at Land’s End on the Baja Peninsula, with more than three miles of pristine golden beaches, picturesque desert cliffs and panoramic ocean views. This exclusive 1,850-acre master-planned community, founded by renowned resort developer Ernesto Coppel, is a paradise of elegance, serenity and service. Occupying a spectacular natural landscape, Quivira Golf Club, a Jack Nicklaus Signature golf course, is complemented by an exclusive oceanfront clubhouse. Quivira Los Cabos is the ultimate destination for residents and guests to live, love and celebrate life. Pueblo Bonito Oceanfront Resorts and Spas has eight award-winning resorts in two destinations, Cabo San Lucas and Mazatlán, all offering luxury all-inclusive options. Each of the properties has its own personality, design and ambiance, yet all share the same high level of impeccable quality and distinguished atmosphere. In Cabo San Lucas, the adults-only Pueblo Bonito Pacifica Golf & Spa Resort is the ideal setting for a romantic getaway, while Pueblo Bonito Sunset Beach Golf & Spa Resort, with its large, all ocean-view suites, is perfect for families. Montecristo Estates Luxury Villas, an exclusive gated community, features private two- or three-bedroom villas spaced along a bluff overlooking the Pacific. Pueblo Bonito Rosé Resort & Spa and Pueblo Bonito Los Cabos, both located on El Médano beach, have the best to offer vacationers looking to be right in the middle of all the Cabo action. In Mazatlán, the elegant jewel Pueblo Bonito Emerald Bay Resort & Spa overlooks the Pacific Ocean and a private beach, while the charming Pueblo Bonito Mazatlán, is located in the famous Golden Zone. Both resorts are great for family vacations and romantic getaways. For more information visit http://www.pueblobonito.com, http://www.quiviragolfclub.com and find us https://www.facebook.com/PuebloBonitoResort and follow us on Twitter @PuebloBonito.